Some online stores are better known than the others. This, however, does not guarantee that the selection is better, or that the quality is higher, or that the prices are lower. Notonthehighstreet is one of such platforms, and sometimes when you start looking for furniture, it seems almost impossible to find TV stands that are not on the high street. Still, there are plenty of other e-commerce sites – and some of them deal with furniture exclusively, which means that the selection of TV stands that are not on the high street will be much more impressive. For example, consider some of these exquisite modern options – options that are widely available in dedicated furniture stores rather than at generalized gift selling websites. This is one of the best solutions for modern and mixed interiors. On the one hand, wood is one of the undeniably classic materials, suitable for traditionally styled rooms. Glass creates a light feeling and is perfect for modern environments. In addition, wood and glass look very impressive if combined together. It is also possible to choose MDF instead of wood, which is a cheaper option. Yet, it does not look so stylish. 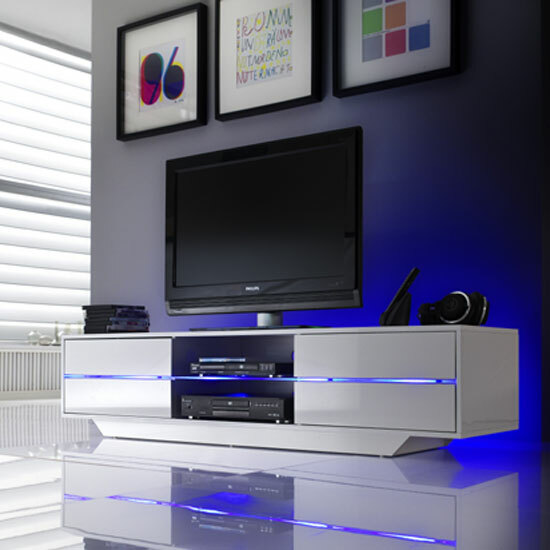 Those are the best examples of TV stands that are not on the high street. The combination of glossy furniture and stylish LED lighting can only be found in specialized furniture stores. Glossy MDF stands look amazing in modern living rooms, and they can be combined with a wide range of modern materials – for example, glass, chrome, leather, etc. Glass stands can be compared to high gloss stands in terms of atmosphere created, but they look way more impressive, rich, and elegant. Sure, stands like this will not be made of glass exclusively – they will usually have metal or chrome base, but glass, as the dominant material, looks very sophisticated and modern. A lot of other TV stands are made of combination of glass, high gloss, and metal (chrome, usually). This is a very interesting solution for modern living rooms; however, you will have to make sure that your room space is enough to accommodate a stand like this – after all, it is very eye-catching, and like most eye-catching furniture items, it requires a lot of free space in the room. Yes, do not be surprised – models like these are also real. Rustic stands, in particular, are not difficult to find. Vintage designs are less common, of course – but they are still available in some stores. Speaking of other stores specifically, a great example of another UK platform that can offer you a fantastic selection of quality, stylish interior decoration solutions for your home is Furniture in Fashion . This is a local company that ensures quick deliveries all across the country and vouches for the impeccable quality of every distributed item. The store works with the manufacturers directly, which allows the company to keep prices affordable, too.